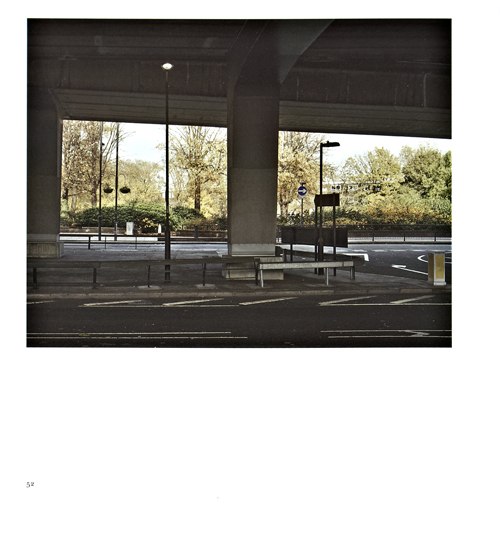 John Riddy’s new series of urban landscapes, his first to be made in London, offers us fragmentary glimpses of housing estates and tower blocks, the underside of a flyover, details of City and West End landmarks, a roadside wall, trees in two urban parks and a couple of views across the Thames. It is an eclectic mix of details and vistas, two dimensions and depth, grandiose and functional, natural and man-made, daylight and dusk. But what unifies this somewhat random-seeming collection is Riddy’s trademark stillness, his exquisite formalism and his focus on the mundane and the overlooked. Revelation of the unexpected wonders of the built environment is a classic photographic topos. Atget, Walker Evans, the Bechers, Eggleston and many others built their careers out of it. The fact that photographers such as Riddy can still make highly seductive urban landscapes out of the methodology of revelation is testament to the infinite capacity of the world to surprise, and of the artist’s ability to see. Yet it is not so much the overlooked beauty of the world that such artists respond to, but rather the capacity of the everyday world, fragmented into the rectilinear shapes of photographs, to make extraordinary pictures: a critical distinction – obvious perhaps to some, but too frequently forgotten. The beauty of a photograph is a different species of thing from the beauty of the world; there is only a tenuous connection between the two. Photographs confine the infinite, they fix shapes and relationships, they anchor the world and so construct something new. It is this sense of anchoring that typifies Riddy’s oeuvre. His photographs have a stillness, a mesmerising quality that is only partly the result of an absence of people and event. In London (Marylebone), for instance, we see the underside of the A40 Westway. The frame is filled with detail, democratically but asymmetrically ordered, which sustains our attention through the process of repeat discovery, and yet the structure has clarity and openness. The scene has depth but minimal layering: the image calms; it does not confuse. Above all the image is contained; its principal formal elements sit within the frame. Despite its manifestly fragmentary nature this photograph does not suggest a world that continues beyond its borders, or one existing at a particular moment. It is somehow complete in itself and eternal. The slender central lamp-post with its soaring eye of light will, it seems, shine on, delicately poised in an immutable relationship to the mighty pier, the underside of the flyover and the background trees. Yet there is more at work here than formal design. Riddy is not just a pattern maker. A comparison with Callahan’s semi-abstracts of Chicago buildings made in the 1940s is instructive. Callahan’s images delight at first, but they do not grip. They are too mannered, too openly designed for graphic effect, their radical crops too transparent a creative strategy. In Riddy’s pictures the art is concealed. He shows us places we might know ourselves, seen as we might see them. The series is titled Low Relief , partly for the textured surfaces we are shown, partly too for the comfort that is offered by familiar places – places that ‘might have been dreamt [or] half-remembered’, according to the gallery statement. There may be something in this. As we gaze into Riddy’s silent pictures, centred and calmed, undistracted by events with which we know we have no connection, it may be that the scenes he depicts lodge themselves in our minds as places curiously familiar. We all have our own variants on AE Housman’s ‘blue remembered hills’, yearned-for places emblematic of times in our lives that have passed. Can photographs evoke anything of this type of memory? For most people, visual memory probably works more in the manner of ultra-short video clips than still photographs; but significant places are often recalled from one viewpoint, it seems to me, not so much remembered immersively as looked at with a certain detachment that reflects the distance between our present selves and the past. Our emblematic memories are generally less sublime than Housman’s too; more typically they may be, say, a street corner, or an entrance to a shop, or a building repeatedly seen from a passing car, or a glimpse through a lit window at dusk. Ordinary things; the subject matter of this show. It is not suggested that Riddy’s locations have any special significance for him as the artist; rather they are representative, exemplary and universal. This makes his work at once more open-ended in its conceptual underpinning (why stop at these few pictures? Where to end? ), but also more firmly grounded in its art-historical context. For although his work might resemble in many ways the modernist realism and urban subject matter of Walker Evans, and the cool detachment of the late 20th century German school, its animus was born in the woods and fields of the English landscape tradition, alongside Sutherland and the Spencers, Hitchens, Bateman, Piper and the grandfather of them all, John Constable. For such artists landscapes are neither depicted for factual information, nor as celebrations of the beauties of the world, nor idealised for sentimental or sublime effect; they are represented instead as repositories of human experience, and triggers for introspection and memory.